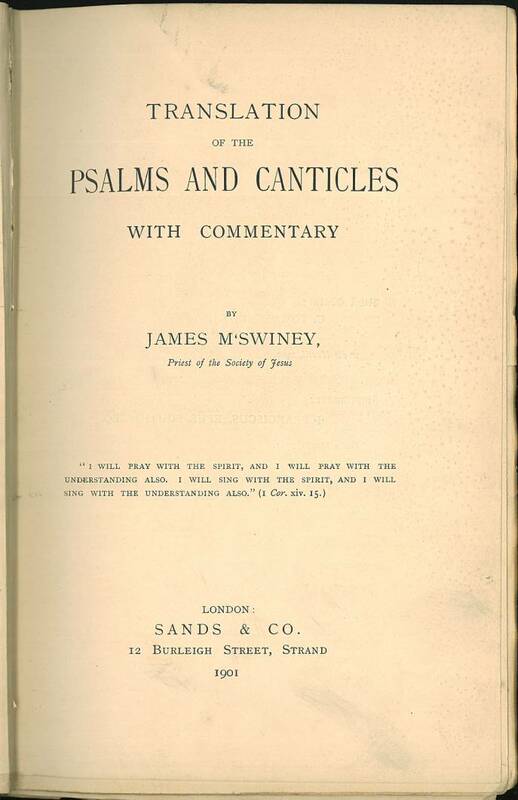 James M’Swiney includes two translations of the Psalter – one from the Hebrew and the other from the Vulgate. 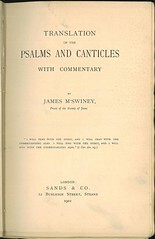 In addition he includes Psalm 151 and several canticles used in the morning and evening offices of the Church of Rome: Exodus 15:1-19, Deuteronomy 32:1-43, 1 Kings (1 Samuel) 2:1-10, Isaiah 12:1-6, Isaiah 38:9-20, Daniel 3:57-88, Habakkuk 3:1-19, Luke 1:46-55, Luke 1:68-79, and Luke 2:29-32. Publisher: Sands and Co.: London.